Ireland began its sixth Presidency of the European Union on 1 January 2004. This six month period was a time of great challenge and hope for the EU and its neighbours. The accession of the ten new Member States on May 1st was a truly historic moment, laying finally to rest the East-West divisions of the post-war period. This new dawn was celebrated at the "Day of Welcomes" in Ireland when European leaders came together in Dublin to launch the EU on this new phase of its development. The EU took another significant step forward when, on June 18th, the European Council agreed the new Constitutional Treaty for Europe. Against this background of major historical and institutional change, Ireland’s Presidency also sought to make progress on the Union’s economic, social and environmental agenda. On the legislative front some 80 legislative proposals were concluded with the European Parliament during the Irish Presidency representing some 20% of all legislation adopted during the Parliament’s five year term. In the justice and home affairs area a substantial body of work was completed in the areas of immigration, asylum, police cooperation and crime, action against drugs and better access to justice across borders for Europe’s citizens. In the international sphere the Irish Presidency worked to develop the Union’s relations with the wider world. through the development of policies aimed at promoting a fairer, peaceful and more secure world. There was a particular focus on strengthening support for the UN system. A renewed emphasis was placed on the Union’s relationship with Africa and particular attention was given to the Union’s development priorities, including the fight against HIV/AIDS. The transatlantic relationship is central to meeting the challenges of today’s world. The Irish Presidency has worked to strengthen and develop the EU-US relationship, as well as other key partnerships, on the basis of shared interests and values. The accession of the ten new Member States was one of the defining moments of the Irish Presidency. 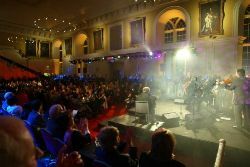 The celebrations in Dublin on May 1st with the participation of leaders from the 25 Member States, Bulgaria, Romania and Turkey, as well as the Presidents of the European Parliament and Commission marked the historic and inclusive nature of the occasion. Making a success of enlargement was a key priority for the Irish Presidency which worked intensively with the Commission and the Member States to ensure a smooth transition from a Union of fifteen to twenty five. At the European Council on 17/18 June, the Presidency succeeded in securing agreement on a Treaty establishing a Constitution for Europe, in what has been greeted across the Union as an outstanding negotiating achievement. At the European Council, two days of intensive negotiations, both in plenary format and in a complex series of bilateral and multilateral meetings with partners, resulted in consensus on the outstanding questions, including the future size and composition of the Commission, the voting system in the Council, and the scope of qualified majority voting. The many innovations of the European Constitution include its Articles on the nature of the Union, its powers and the limits upon them, its statement of the Union’s values and objectives, and the incorporation on a satisfactory basis of the Charter of Fundamental Rights. The successful outcome of the Intergovernmental Conference is above all important in offering to the Union and to citizens a single, consolidated European Constitution which will serve as the Union’s basic law for many years to come. 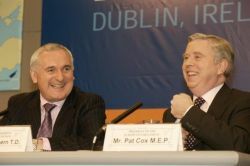 "This represents a high point in the 40 years of Ireland's consistent pro-European diplomacy pursued by successive governments since the days of Seán Lemass, with the assistance of dedicated civil servants in the Permanent Representation in Brussels, the Departments of Foreign Affairs, the Taoiseach, Finance, and right across the public service." "The sixth Irish Presidency of the European Union ends at midnight tonight and is being hailed as one of the most successful ever. Taoiseach Bertie Ahern, with a mixture of luck, political ability and a good civil service, expertly managed the EU's main decision-making body during the past six months." "The Winner's Name is Bertie - How the EU Constitution Compromise succeeded thanks to a crafty Irish Presidency." "Canny pragmatism proved vital. And it helped that he came from Ireland, the glittering Celtic success story of European integration." "Ireland's presidency will be remembered for successfully steering through the passage of the EU constitution and presiding over the entry of 10 new countries into the union on May 1." "To Bertie Ahern too, who holds the helm of government of another country that represents an EU success story, I offer my compliments for the outstanding diplomatic skill he has shown in bringing the Union to agreement and unanimity on matters of great complexity. The Irish Presidency is one we will long remember." "You have been the engine of everything that has happened in the past few months. The Irish presidency will live in our memory as a great presidency. What a great job Bertie has done. Congratulations." "Without the Presidency's decisiveness, the result would not have been possible." Celtic Countries is the online magazine for people who enjoy the Celtic nations, their natural splendour, culture, and lifestyles.